I don’t know about you but the most used piece of kit in my kitchen is my non-stick fry pan. 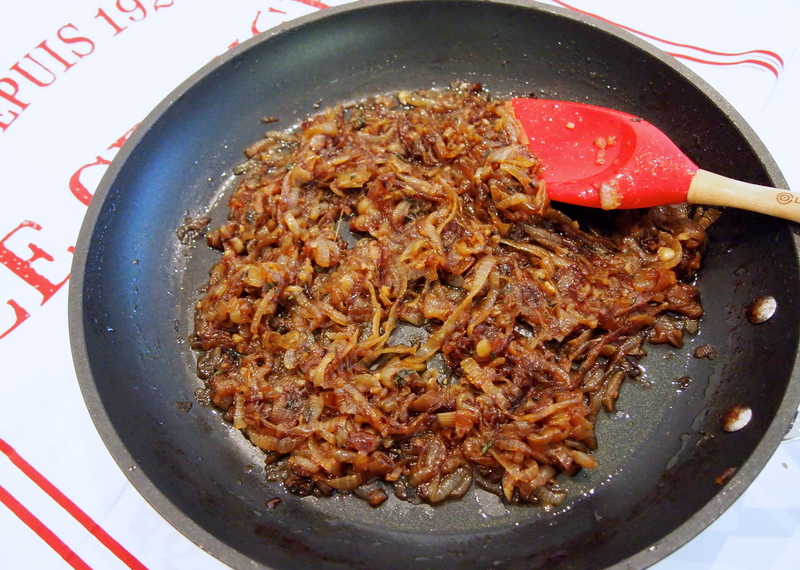 I use it at least once a day, whether it’s for eggs on the weekend, searing meat, sautéing just about anything you can think of or, as in this case, caramelising onions. Due to it’s high usage, it’s also the piece of equipment I need to replace most frequently, and let me tell you not all non-stick pans are created equal. The things I look for are thickness and weight, metal handles so it can be transferred from the stove to the oven, the ability to be used on all cooking surfaces (e.g. induction – you would be amazed how many pans are still out there that aren’t induction friendly), and possibly the most important is for it to be PFOA free. The new range of Le Creuset non-stick pans tick all those boxes. 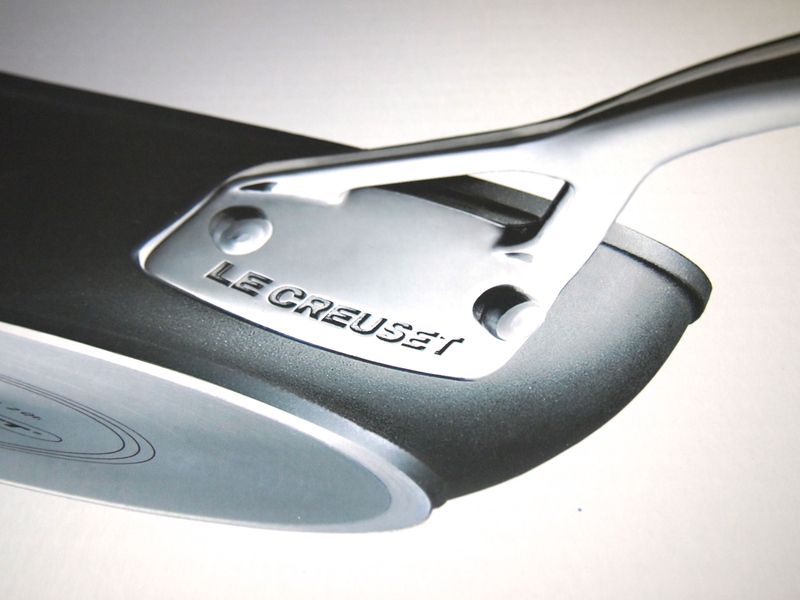 They are reassuringly weighty and you can tell that the non-stick coating is reinforced onto the pan extremely well which means that with careful usage it’s going to last a very long time, so long that Le Creuset even offer a Life Time Guarantee! I also love the fact that their non-stick range is labelled as being dish washer safe but quite frankly the Le Creuset fry pan cleaned so easily I wouldn’t bother wasting space in my dishwasher. 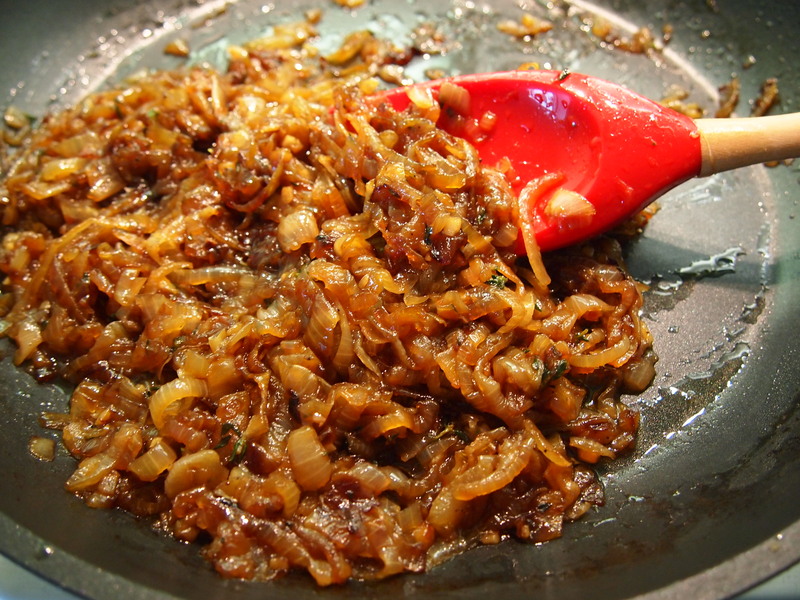 There are just some things that scream to be made in a non-stick pan and caramelised onions is one of them. I’ve tried doing them in a normal stainless steel pan but I can never achieve the same depth of colour. 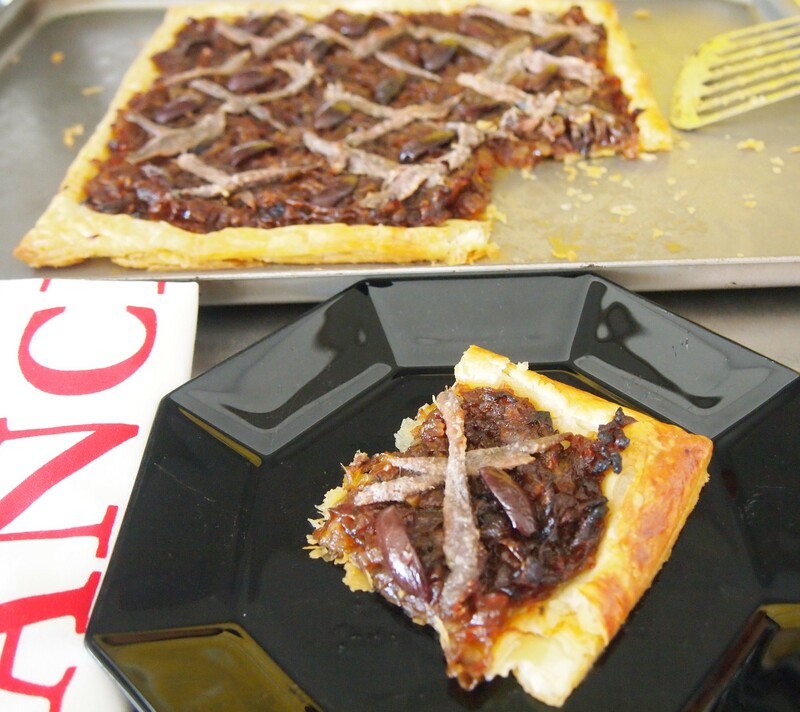 It’s very handy to have a batch of caramelised onions sitting in the freezer for when I want to make burgers, sandwiches, pasta or this tart, pissaladière, which hales from Southern France and is utterly delicious. 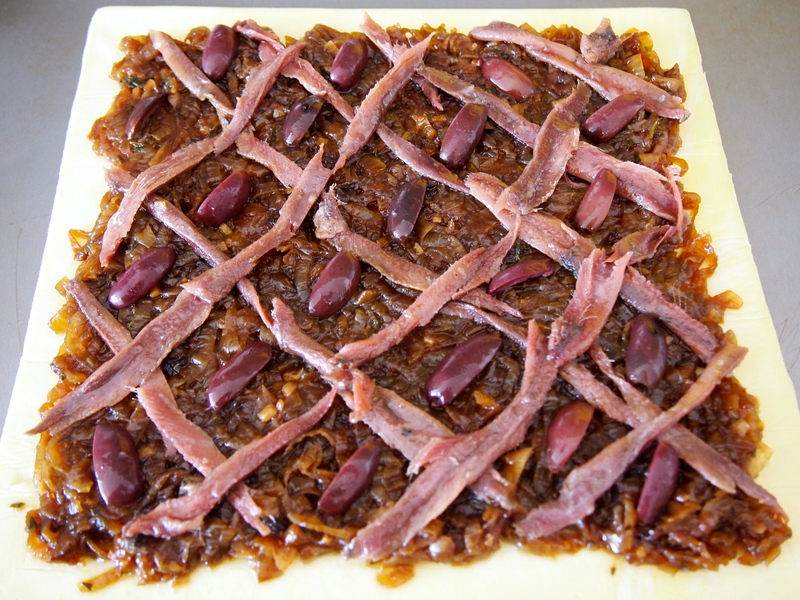 Some people refer to pissaladière as French pizza, the similarity being that the toppings of caramelised onions (lots of them), anchovies and olives sit on a pastry base. Yes, I said anchovies but stay with me, even if you’re one of those people who think you don’t like them, this tart will convince you otherwise. The savoury saltiness of the anchovies is the perfect counterpart for the sweetness of the onions so there’s a fantastic harmony of flavours in every mouthful. Believe me you won’t taste anything fishy at all. But the star of the show in this tart is the onions and whilst caramelised onions can take a while to cook they aren’t difficult – all they need is a little time and a good pan. So cook them nice and slow and enjoy the amazing aromas that fill your kitchen. 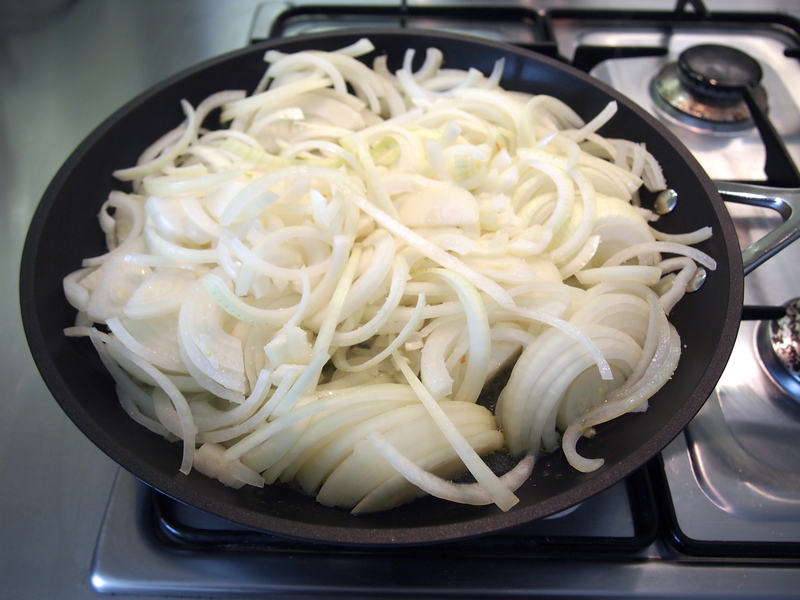 Place a large heavy based fry pan or skillet, preferably non-stick, over a medium-low flame. 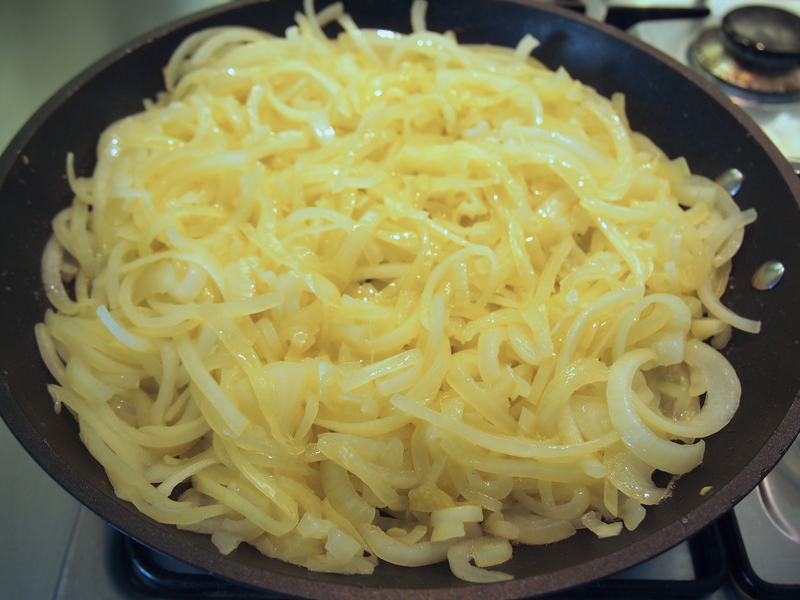 Add the oil and butter and when the butter has melted add the onions along with a pinch of salt. Stir the onions to coat them with the oil. Reduce heat to low – I have my heat on just a little above the lowest setting, and cook stirring often for about an hour. You don’t need to stand over them but don’t go too far away, as you need to give them a stir every five minutes or so. 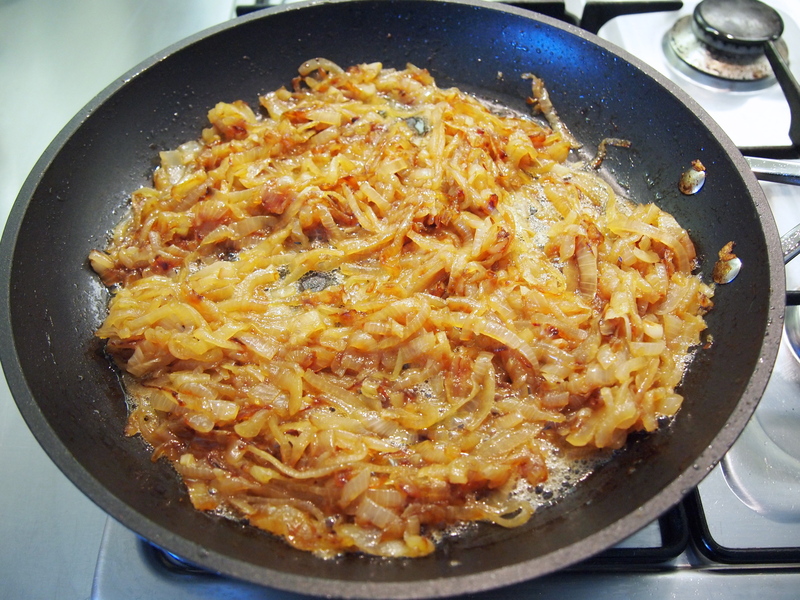 Over the course of the hour the onions will slowly caramelise and become meltingly tender. The pictures below show the onions at 15 minute intervals with the thyme and garlic being added in the last fifteen minutes. When the hour is up and when you’re happy with the depth of colour of your onions, season them with a little salt and pepper and add the vinegar, stock an sugar and stir scraping any residue on the bottom and sides of the pan until the liquid has evaporated. Turn off the heat and set the onions aside to cool. At this stage you can freeze or refrigerate the onions if you wish. They last for about a week in the fridge and for at least a month in the freezer. To make the tart, preheat the oven to 190C. Take the pastry out of the fridge, you want it to be nice and cold, and place it on a baking tray lined with baking paper. Lightly score a thin border around the edge of the pastry with a sharp knife. 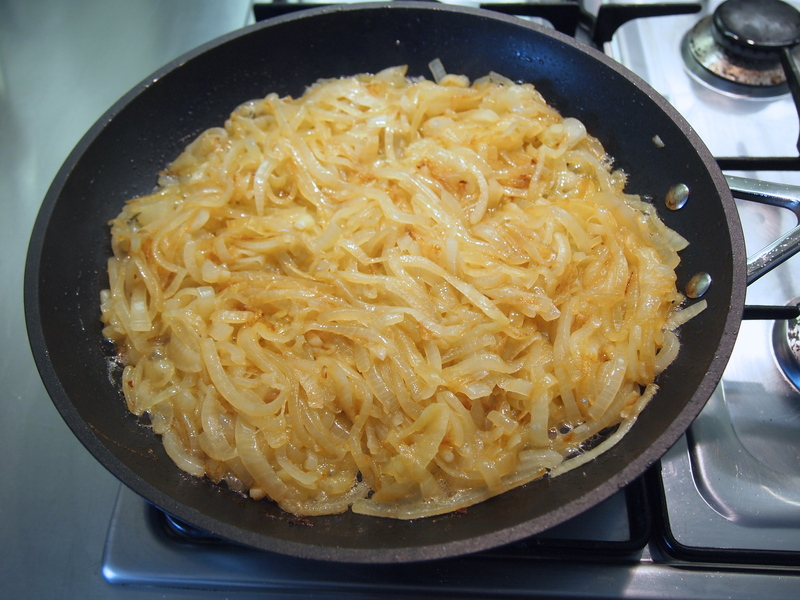 Evenly spread the cooled onions over the base making sure you stay within the scored border. 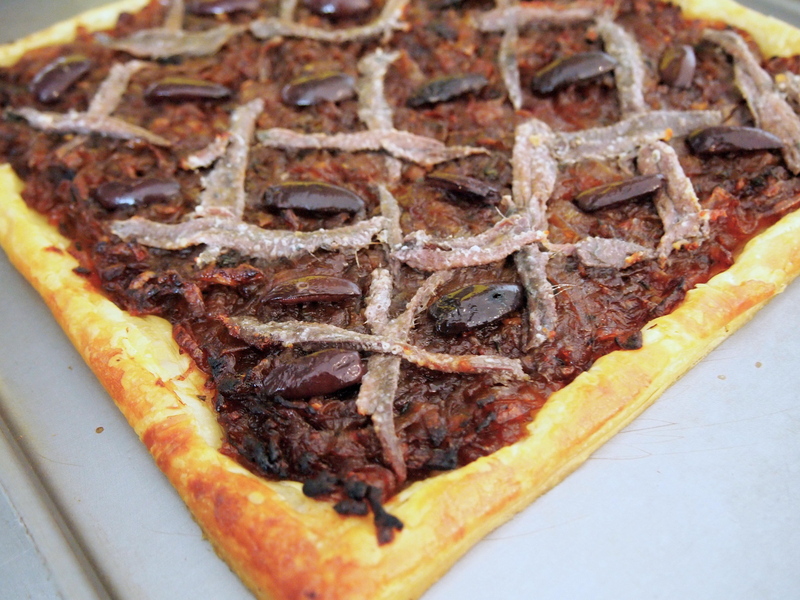 Make a lattice pattern with the anchovies. 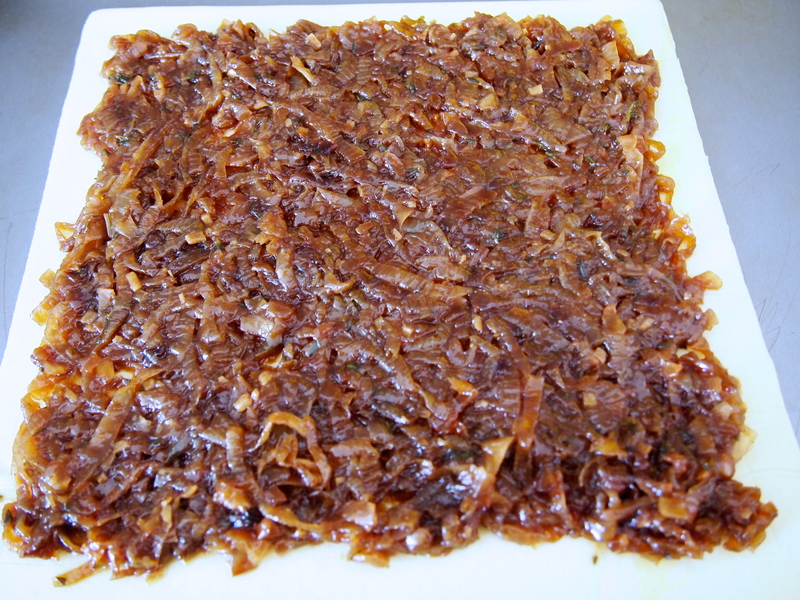 If you find that your anchovies are quite wide just cut them in half lengthwise. Place an olive in the centre of each lattice. Brush a little milk over the exposed pastry and bake for about 15 minutes or until the pastry is golden. 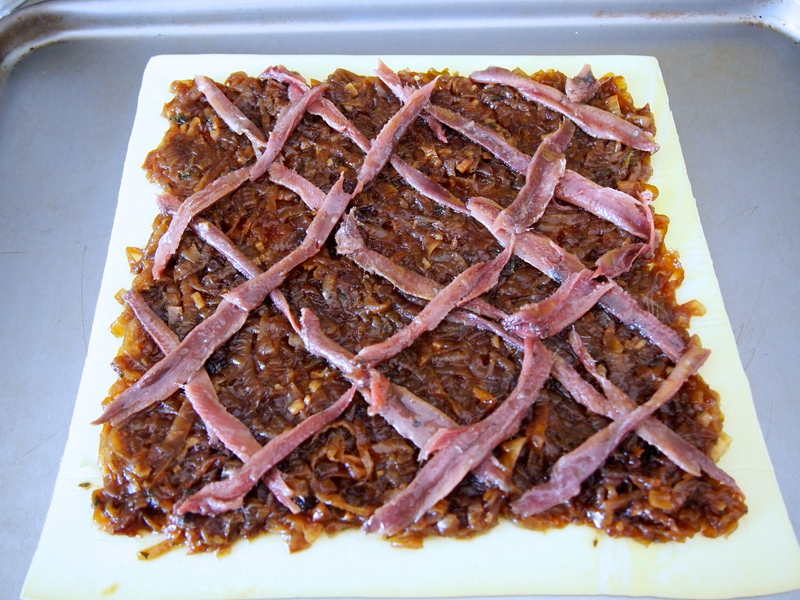 Remove from the oven and let cool for 10 minutes before cutting into squares. You can serve it hot or at room temperature.